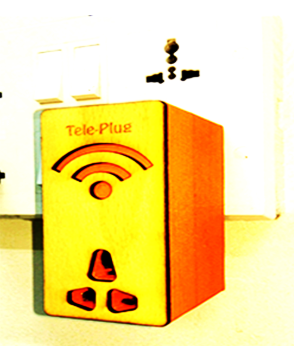 Tele-Plug is an IoT based smart plug controlled by Telegram. It is an IoT based voltage current monitoring and controlling plug. This project is a Smart Plug named as Tele-Plug. It’s an IoT device that can control over Telegram. Main Advantage is once we use to connect any of equipment to a power supply using this we can know the voltage and current consumption and also we can turn on and off its operation. We have used Atmega328p board to measure the voltage and current. Besides that for measuring voltage, we used a signal conditioning circuit that consists of scale down part and offset part. The output from this, is connected to Analog pin of Atmega328p(A1) and the Current sensor has two inputs: Signal and GND; Signal connected to A0, Either neutral or Phase should pass through the current sensor. Therefore after making the calculation data from MCU send it to ESP8266 using serial communication, it receives data and stores it in particular locations. Inside the esp we need to write a program that can communicate with telegram API, I got the useful library named Universal-Arduino-Telegram-Bot. This library helps us to communicate ESP8266 with the telegram. Body: The case for the Product printed in PLA – Fusion360 file named (fabplug v7.f3d) which includes all the three cases. It includes 3 Parts and export as Bottom .stl, Top.stl and Inner .stl. These are printed in Ultimaker and GCODe is generated using Cura by giving fill density of 30 percent and top and bottom layer thickness of 1.2mm and Shell thickness of 1.2mm.